Dire warnings of the danger that the deadly bacterial disease American Foulbrood (AFB) poses to SA’s honeybee industry have been sounded since it was first identified in 2009. But though it is extremely serious, AFB is by no means the greatest menace faced by the industry. “The dwindling availability of suitable forage for bees to feed on is the most serious threat to the bee population,” says Brendan Ashley-Cooper, of the Western Cape Bee Industry Association and one of SA’s foremost beekeepers. Ashley-Cooper lays blame primarily on the large-scale felling of exotic gumtrees (eucalyptus). “The industry was built on gumtrees as the main source of forage,” he says. Gumtrees are indigenous to Australia. Their numbers have been in steep decline since six of the 85 species in SA were declared invasive plants in 2002. “All species have been demonised,” says bee expert Mike Allsopp of the Agricultural Research Council. A decline in suitable bee forage is not unique to SA, says Allsopp. However, unlike SA, many countries are taking action. In the US, for example, a federal project is in place to help farmers establish 3mha of bee forage. It is equal to the total area for maize growing in SA. A lot is at stake in this country and worldwide. “Bees provide a critical ecosystem service and without them we are all [at risk],” says Allsopp. 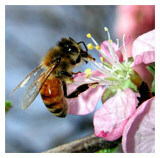 They are referring to the crucial role bees play as pollinators in agriculture. “There are no alternatives to bees for pollination,” says Allsopp. The Western Cape’s agriculture department says that of the 115 leading global food crops, 87, or 76%, are dependent on annual pollination. In SA pollination services provided by beekeepers contribute about R16bn annually to GDP. About R10bn of this is generated in the Western Cape, where the fruit industry makes the biggest demand on bees. And demand is growing apace. “Demand for pollination services will double in the next 10 years,” says Ashley-Cooper. Beekeepers are already stretched to the limit. The Western Cape fruit industry alone requires between 120 000 and 140 000 pollination units annually. A unit is a hive of up to 6 0000 bees. Demand is already putting huge stress on bees which, says Allsopp, will literally do their job of pollination until they drop. “We are making them work far too hard,” he says. Adding more stress are pollution, pesticides, urban sprawl and even electro-magnetic fields, says Allsopp. AFB adds another stress, but so far it is confined to the Western Cape. Fortunately it appears not to be a wholesale disaster. “My best estimate is that 2%-5% of hives have been infected,” says Allsopp.